Kids are back to the school today after a long school break. And I'm back too ... for bento making and blogging. After my long bento break, I need to push myself and get rid all these lazy holiday bugs to make bento again this morning. I made 2 green boys from rice balls, decorated with nori, crab stick and cucumber for the ears. I also put fried prawn ball, Chinese cabbage & yellow paprika stir fry, and mini sausages inside the bento box. The portion was definitely too little for the kids this time. When I picked them up at school, my boy said he was still hungry so they had double portions for the afternoon snack. If you ask me whether I have made a special plan for my 2011 bento then the answer will be NO. I'm still enjoying my bento making and don't want to make it too pressure for myself. So I'll let it flow day by day and keep sharing it in this blog. My agenda is full for this month with some activities that I decided to join up, my little brother's upcoming wedding in Semarang (1 hour domestic flight from Jakarta), and next week my sister and her family are coming to Jakarta. They will stay in our house for 3 weeks. With the twins, I think I will be quite busy around the house and as their private driver LOL :D So forgive me, if this January will still lack of bento post. I have made some arrangements for school catering this month. So my bento making for January will be on and off. Anyway, it's glad to be back again for bento. I missed a lot of bento posts from all of bento friends, so have to catch up after this post. Wish everyone a great week and happy bento-ing! Happy New Year and Happy Back to school, Lia!!! So happy to see your lovely bento again...miss your bento post so much..hehe. While you are busy with all your upcoming activities, please remember to take good care yourself too. I think this bento is adorable. I know I have been very lacking in my bento posts. So it's nice to know that other's will certainly understand. We will still be here waiting for your next one. It sounds like you will be super busy with a full house. That's great though to have family around you! Happy New Year! I'm so glad that I was able to see your post this morning :) I love how you filled the slim box. The slim bento box that I have gives me trouble figuring out how to put food into it. Have a wonderful time with your family, it sounds like it will be a lot of fun!! Happy new year Lia !! Your two boys are so cute ! You'll be busy for next weeks, but I hope you'll enjoy your family ! I'm really loving this! Happy New Year Lia! Hope you were able to really rest up this holiday season. Because it sounds like you are really going to need it for this month. haha! :D I think this year of the Rabbit, it's a time to take it one day at a time. No pressures, no commitment follies. Just a year to enjoy. And I hope you *do* enjoy it Lia! All the very best. Beautiful bento and Happy New Year to you too Lia! :) Hope you had a wonderful vacation! @Susan Yuen : Thanks a lot Susan! We had a wonderful vacation and enjoyed the break :) Happy New Year! May God always bless you and your family through out the New Year. @sherimiya : Last time I saw the twins, they were still tiny and my sister told me that they are crawling everywhere now. Times ... Hope they won't cry to see their Auntie LOL :D I will share the pictures later via twitter ;) Thanks a lot Sheri! Welcome back Lia, and Happy New Year to you too! You made such lovely bentos even are not into the mood yet. Hope you had a great time with your family and relatives. Happy New Year to you Lia! 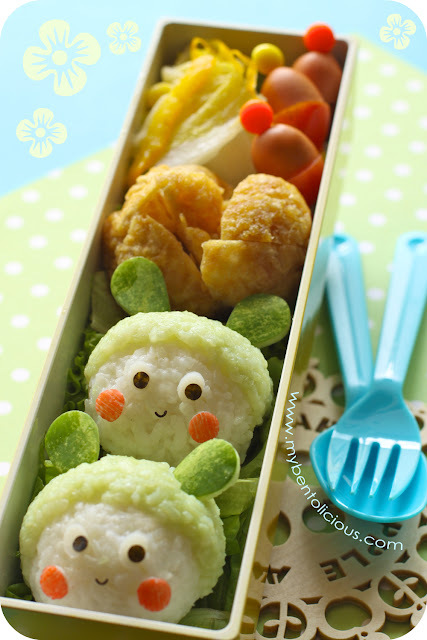 love n cute bento mba Lia..
its hardly waitingto see the picture, will u share to us on your blog? hi, salam kenal, Lia.. welcome back. A happy feeling indeed to see a new adorable bento from you, Lia! Hope your holiday was wonderful, wishing you a brilliant 2011!